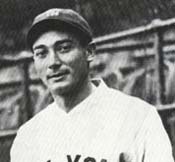 A member of the original 1933 All Star team, Lazzeri was part of the famed "Murderer's Row" of the 1927 Yankees, and is considered one of the top hitting second basemen of his era. He finished his career with a .292 batting average, 178 home runs, 1191 RBI and 148 stolen bases. Lazzeri still holds the single game RBI record with 11 and was the first player to slug two grand slam home runs in one game (May 24, 1936).